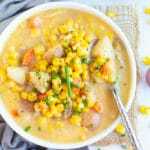 Instant Pot Potato Corn Chowder is a quick and easy gluten-free, dairy-free, vegetarian and vegan soup recipe that is full of flavor! This healthy soup recipe can be ready-to-eat in under 30 minutes! Set 6-quart Instant Pot to the sauté function and add oil, diced onion, and crushed garlic. Sauté for 2-3 minutes. Add potatoes, carrots, corn, broth, thyme, rosemary, salt, pepper, and paprika. Make sure to scrape the bottom of the pot to ensure no bits or pieces are stuck. Cover Instant Pot with lid, ensure the pressure release valve is set to sealed, and turn on high pressure for 8 minutes. While chowder is sitting, whisk together warmed almond milk and 3 tablespoons tapioca starch in a medium-sized bowl until smooth. Turn Instant Pot on the sauté function and add milk-starch mixture. Stir for 4-5 minutes or until chowder has reached your desired thickness. If chowder is too thick, add more almond milk or broth. *Chowder freezes well for up to 3-6 months in large, plastic containers such as these.